To most people today, the words "ice storm" bring to mind slippery roads, snapped tree limbs, and broken power lines. But in the 18th century, George Washington used that time to harvest a most unusual crop: ice. Washington was thinking ahead to the summer and the chilled and frozen desserts he and his family would enjoy long after the arrival of spring. In order to provide this luxury, enslaved workers collected ice from the Potomac River on the coldest days of winter. 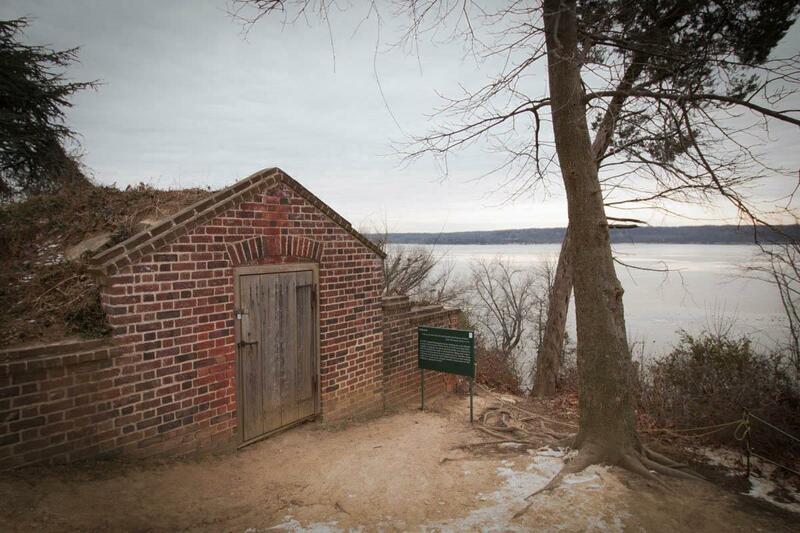 Washington's diaries and letters, particularly after he rebuilt the extant ice house in 1785, frequently reference ice and the special structure he built to safeguard the valuable commodity as temperatures began to soar. Washington's ice house stands in the far southeast corner of the east lawn, but the majority of the largely masonry structure sits underground. It is entered through a door at ground level into a vaulted main chamber built into the sloping east lawn. The chamber has a planked floor with an opening in the center that provides access to a brick-lined well, called a dry well. Blocks of ice would be stacked in the 20-foot-deep well, with straw packed between and around them. A vaulted tunnel, just high enough to crawl through, leads from the bottom of the well to the east side of the hillside facing the Potomac River. Filling the ice house was a dangerous activity, and the detailed weekly reports maintained by Washington and his managers in 1792 illustrate the challenges. Slaves from Mansion House, Dogue Run, Muddy Hole, River, and Union farms all assembled for the process of ice collecting. For two weeks in January, about 200 men worked at one time to harvest ice. In addition to the perils faced while cutting and hauling blocks of ice out of the frozen river, the ice house itself was so damp that the wooden platform covering the “deep well” was prone to rotting. Washington obviously saw this as a safety hazard to his men and asked his farm manager to test the joists, because if rotten, "they may give way and destroy those who may be below pounding the ice as it is thrown in." Both the interior and exterior masonry suffer from the seepage of ground water, which causes the failure of both the masonry and its connective mortar. The tunnel vault started showing signs of collapse as ground water has softened the mortar holding the brickwork together. The structure will need extensive work to first stabilize it and then to return it to its 18th-century appearance. Prior to beginning repairs, however, the entire structure will need to be assessed by both engineers and conservators in order to determine the scope of the preservation work. Archaeologists will also likely need to excavate to reveal the full exterior of the tunnel, as it is not safe to perform tunnel work from the inside. Once the project scope is determined, all of the work will be done using period-appropriate techniques and materials. Your gift today will help us ensure this important work begins as soon as possible, but we need the funding in place before we can remove the first shovel of dirt. This structure tells the story of a resource that is now considered accessible but that was considered a luxury in the 18th century, bringing to life the immense labor that went into a dish of ice cream.